This perfectly enjoyable CD first appeared in 1987 on the Musical Heritage Society label. I am glad that it has been reissued so more people have the opportunity to hear it. The combination of instruments in Piccolodeon might seem a little strange on paper, but the trio's sound is often not far removed from that of a traditional folk ensemble. This is particularly true in Appalachian Suite (not Copland, but six tunes arranged by Dan Fox) and The Irish Folk Fest (five tunes arranged by Fox and William Moersch), which suit Piccolodeon so well that one might not guess that anything out of the ordinary was going on. 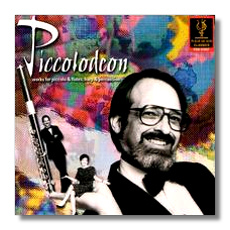 The Peruvian Suite, compiled by Piccolodeon, is adapted from a book of Inca melodies arranged for flute and piano. This arrangement is a successful attempt to rid six of them of the manners they acquired in those domestic arrangements. Kestrel is an original work by Preston Stahly, who was born in 1951. This 12-minute portrait of the brave falcon-like bird is almost impressionistic, and it reveals the ethereal, freer side of Piccolodeon, who requested its composition. The last two works on this CD also are arrangements by Dan Fox. This time, however, the original music comes from the classical side of the fence. Béla Bartók's Sonatina, a piano work from 1915, nevertheless owes much to folk music from Hungary. Once again, Piccolodeon's performance is unforced and natural. Piccolodeon tops all of this, however, with their innovative and surprising playing of Claude Debussy's Children's Corner Suite, another work for piano. Three musicians share the duties customarily performed by one pianist without dulling the music's impact, and the added colors don't seem foreign to Debussy's original concept at all. Fleur De Son's notes contain biographical information about all three musicians. Trott, whose specialty is the piccolo, has played that instrument and the flute with the Buffalo Philharmonic Orchestra, and he has been active as an educator too. The label promises more releases from him. Cutler teaches at Brooklyn College's Conservatory of Music and has been active as a performer in the New York City area. Moersch teaches at the University of Illinois. The notes don't say what became of Piccolodeon; was this CD a "one off," or is there more material waiting to be released? Although this CD places few demands on me, that's OK during and after a hard day at work. This is classical "easy listening" music that respects both the listener's ears and brain.